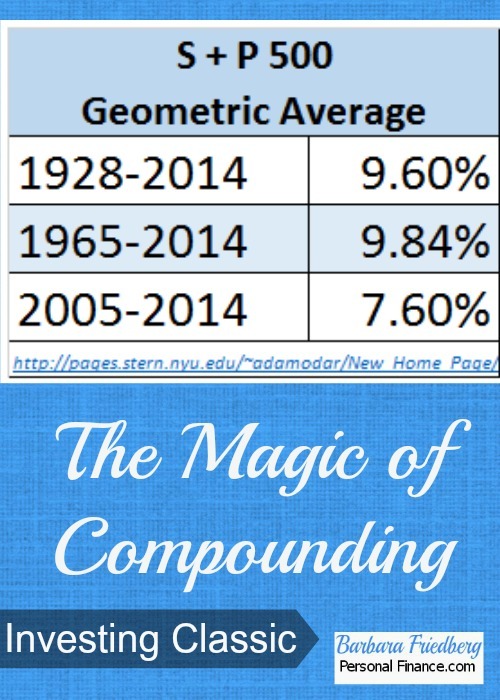 What is the Magic of Compounding? One of the greatest investors of our time attests to the simplicity of investing in the stock market. Read this post and find out why. Following is the “Cliff Notes” version of why you need to put part of your long term investment dollars in the stock market. The historical long term growth of American business is amazing. American business is frequently represented by the Standard and Poor’s 500 Stock Index (S & P 500). This index of 500 stocks is considered a barometer for the complete US Stock Market. Forget about the previous recession and downfall of the stock markets for a minute and take a peak at some historical returns of the S & P 500. Although historical returns do not guarantee future returns. When looking at these returns, think about the stock market as a collection of U.S. businesses, not mutual fund or brokerage account statements. Then ask yourself if you think U.S. businesses and the economy will grow over the next 20, 30, or 40 years? The first time I really studied this type of data was in 1993. 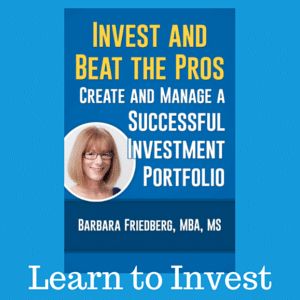 Although I had been investing for a while prior to that time, my husband was still skeptical. I wanted to convince my husband of the importance of putting money into the stock market so I prepared some data for him. Fortunately, for us he was convinced by the historical information, so we boosted our investing at that time and have watched our investments grow over time while continuing to contribute regularly to our investment accounts. But what does this return mean in real dollars? Growth of $1,000.00 – At various interest rates Put $1,000.00 in at the beginning of each period. Do not add any more money. Consider this, if you are in your 20’s, 30’s, or 40’s you have many years until retirement. You can stick some money in a brokerage account at one of the discount brokers (like Fidelity, Vanguard, Schwab, or TD Ameritrade), invest that money in an S & P Index mutual fund or ETF and forget about it. Fast forward 20, 30, or 40 years, it is highly likely that your investment will have grown substantially! Even Rumplestilskin could try this and probably wake up a rich guy after sleeping for a really long time! Certainly, it is better to INVEST REGULARLY and not just one time! 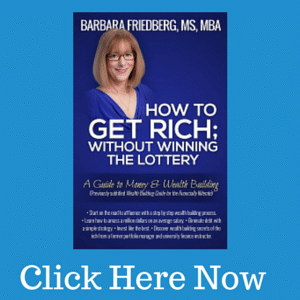 The more time you have, the greater chance you have to get wealthy. Over time, the stock market has been a wonderful way to accumulate wealth. Since the stock market is very volatile, only put money into the market that you can leave there for 5 years or more. Invest only in stock index mutual funds or exchange traded funds (ETF’s) unless you have a lot of money and want to devote hours per week to researching individual stocks. For the best low effort long term returns, AUTOMATE! Have a regular amount automatically transferred in to a brokerage account each month from your paycheck or bank account. Start NOW investing in the stock market to build long term wealth. It’s so much easier than you think! Grow your emergency savings to 6 months of living expenses in a bank savings account or money market fund by transferring automatically from your paycheck or checking account to a savings account. CAUTION: This post if for educational purposes and is not advice to run out and buy a stock mutual fund! Before investing, it is really really important to gain some basic financial education. And before sticking any money in investments you need to have savings for emergencies and no consumer debt! Think of this post as part of your lessons in “financial literacy.” Read this blog regularly, try out the action steps, and learn the basics before you start investing. Keep reading and become financially smart! Does stock market volatility affect your investing activity? I really like the automate tip. My husband has invested a few thousand dollars into a couple of individual stocks. But it didn’t dawn on my that we should continue contributing to our brokerage account so that he could continue investing. We sort of pick individual stocks and haven’t looked into mutual funds or index stocks, so this is a good tip that we’ll use. Thanks, Barbara! Great post. Suggesting to “…think about the stock market as a collection of U.S. businesses, not mutual fund or brokerage account statements”…is good advice. To an old-timer like me you are preaching to the choir. The first day the word “internet” appeared in the Washington Post was 9/26/1988. In 1990 Tim Berners-Lee showed a group of physicists how to get data from his computer by typing in code. They weren’t impressed. They couldn’t see that they were looking at the birth of the world wide web. To me all of this seems very recent and it happened when things were moving a lot slower. It is hard to imagine what is right around the corner in today’s world where information is rapidly moving globally. One of the hardest things is to take a long term view and understand that the world, including the business world, will be completely different in 20 to 30 years. @Little House, For money that you don’t need for the next five years, the stock market has historically been a creator of wealth, but you need to withstand the ups & downs. Vanguard has wonderful, diversified, and low fee index funds. @DIY-Thanks for the historical perspective. I concur that it’s tough to take a long term view. Some individuals believe the present environment will last forever. Let’s just hope that future businesses continuing growing and creating wealth for their shareholders. I love this post. 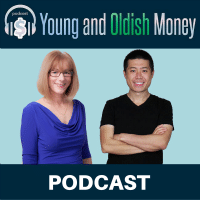 One of the reasons I started my blog is because I kept trying to explain to people I work with the power/magic/savings potential of compounding interest and what it can do to your savings if you are smart about it. I think an important part is to make sure your contributions are REGULAR, as you stated. This is difficult for many people! Great advice Barb. The stock market is certainly a great long-term investment, and your tables illustrate once again that a picture/table is worth a thousand words. I am very concerned about investing in the stock market without appropriate diversification, given so many examples of crappy accounting, corrupt leadership, or huge blunders that cause the golden company to worthless. That’s why I love your comment about mutual funds or ETFs as a preferred method of investing in the businesses. Too bad Vanguard isn’t yet available in Canada. I wish I had gotten started 10 years earlier… well, I am still aiming for a semi-retirement by 40 or before, or perhaps a lot of mini-retirements while continuing to work in the interim! Yes, the last 10 years have shown us deplorable returns in the stock market, as well as lots of horrendous economic & ethical issues (which you alluded to). I agree that recent history further underlines the importance of broad diversification in low cost index funds! If LONG TERM history is any guide, a diversified portfolio will provide a decent overall return. Hi Nick, My thoughts exactly. As the world is so uncertain, I like to make sure that I always have a good fixed cushion of our investments protected from the volatile financial markets. This is very true. It has worked well as we’ve saved for retirement, and even in the 5.5 years since we started investing in college funds, the effect is very noticeable, though admittedly, that’s probably more pronounced given the extended bull market we’ve been in over the last few years. HI Money, So glad to hear that you’re well aware of the abnormally high investment returns of the past five years. A risk for investors today is that they will assume that the stock markets will continue to have double digit returns indefinitely. This is very unlikely.